Pulsed laser deposition is one of the methods of thin film preparation, and several others include chemical vapor deposition, material sputtering, and etc. 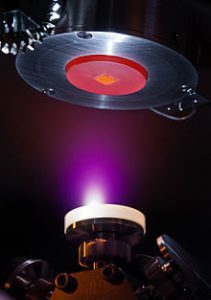 Pulsed Laser Deposition (PLD), also known as Pulsed Laser Ablation (PLA), uses a laser to bombard the surface of the target, raising its surface temperature and further producing high temperature and high pressure plasma ( T>104K), depositing on different substrates to form a film. 1 It is easy to obtain multi- component film that is of the desired stoichiometric ratio by PLD. 2 It has high deposition rate, short test period and low substrate temperature requirements. Films prepared by PLD are uniform. 3 The process is simple and flexible with great development potential and great compatibility. 4 Process parameters can be arbitrarily adjusted, and there is no limit to the type of PLD targets. Multi-target components are flexible, and it is easy to prepare multilayer films and heterojunctions. 5 It is easy to clean and can prepare a variety of thin film materials. 6 PLD uses UV pulsed laser of high photon capability and high energy density as the energy source for plasma generation, so it is non-polluting and easy to control. 1 For quite a number of materials, there are molten small particles or target fragments in the deposited film, which are sputtered during the laser-induced explosion. The presence of these particles greatly reduces the quality of the film. 2 The feasibility of laser method for large area deposition has not been proved yet. 3 Average deposition rate of PLD is slow. 4 In view of the cost and deposition scale of laser film preparation equipment, it seems that PLD is only suitable for the development of high-tech fields such as microelectronics, sensor technology, optical technology and new material films. Stanford Advanced Materials (SAM) Corporation is a global supplier of various sputtering targets such as metals, alloys, oxides, ceramic materials. Please visit our website https://www.sputtertargets.net for more information.